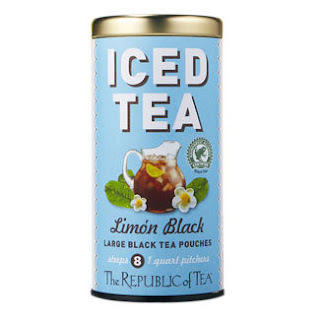 I'm really loving the monthly shipment from The Republic of Tea, and this month it was all about iced tea which is perfect since the local weather is starting to transition from snow to ... uh, well, there's been a bit of rain and hail. But never mind that. It's no longer so chilly that I feel a need to sip warm drinks all the time, so iced tea is a good option. The big teabags (or tea pouches, if you prefer) are designed for making a quart of tea at a time, which is a reasonable amount. And not so huge that I have to rearrange my fridge to make space. I've been brewing the tea in quart canning jars, since they're safe for hot liquids and I've got plenty of them around. The teas also come with instructions for "safe steeping" which is handy, and of course instructions on how long to steep. I have to say that I really never paid much attention to instructions about how hot water should be for tea or how long to steep, but it does make a difference. See, I'm learning new stuff here. 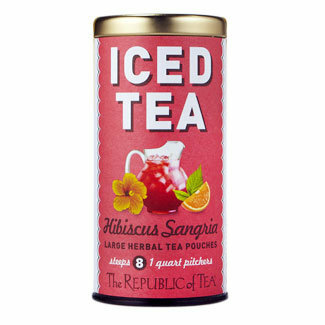 Inspired by traditional Spanish sangria (and caffeine-free since it's an herbal blend) Hibiscus Sangria Herbal Iced Tea reminds me of berries. Mostly raspberries. I adore teas with hibiscus, and the color is so darned pretty. A cold pitcher of this with fresh berries and some citrus slices floating in it would make a great summer drink. Maybe some sparking water or lemon-lime soda for a little fizz. Maybe a little tequila for the adults. I think this could be a great alternative to regular fruit punch. Since this one is caffeine-free, it would also be great for kids, and you could serve it unsweetened, naturally sweetened with some fruit juice, or add the sweetener of your choice in the amount of your choice. The Ginger Peach Black Iced Tea is similar to the ginger peach tea that I received in another shipment. I love the flavor. When peaches are in season, they'd be a great garnish for this tea. Just spear a bunch of peach slices on a skewer, and have a little nosh with your drink. Limon Black Iced Tea is Kosher-certified and has blend of black tea from three Rainforest Alliance Certified tea gardens. I didn't know there was such a thing, but now you know, too. The limón in this tea isn't just a weird spelling of lemon - it's actually dried lime from Guatemala - and it adds its citrus brightness to this tea. This would be a perfect iced tea to use for an Arnold Palmer - a mix of iced tea and lemonade. Wikipedia says, "According to Palmer, he was in the habit of drinking ice tea with lemonade at home, and in 1960 at the US Open at the Cherry Hills Country Club in Denver, CO, he ordered the drink at the bar. A woman sitting nearby overheard him, and ordered 'that Palmer drink,' thus giving the mix its name." I like that there's a Colorado connection. And I like citrus. If you don't want to mix this with lemonade, it would still be good with lemon, orange or lime slices as a garnish. Doesn't that sound summery? Makes me want to go out and buy a big floppy garden hat with a long, flowing bow. And no, there will be no photos of me with a garden hat, flowy bow or not. 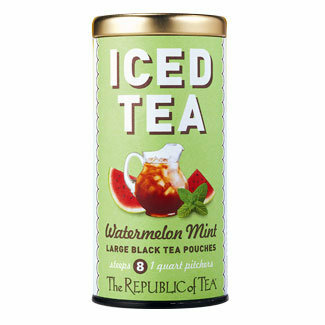 The Watermelon Mint Iced Tea surprised me. Watermelon is a subtle flavor, but it was noticeable in this tea. My vision for this one is a watermelon/tea granita. Or maybe a watermelon/tea slushie. Remove seeds from watermelon and freeze. Put the prepared, chilled tea in the blender along with the frozen watermelon chunks and blend. Doesn't that sound good? You could also freeze the tea in an ice cube tray and make your slushy even slushier. And here's my super-tip of the day. FREEZE THE TEA. Yup, freeze some tea in ice cube trays and use them in your iced tea drinks. That way you don't water down the tea as the ice melts. Mix and match flavors, or pick a neutral flavor for the cubes so it will match with all the iced teas. And the frozen tea cubes might be interesting in cocktails, too. Right? Or am I just crazy? But it's not all about me. 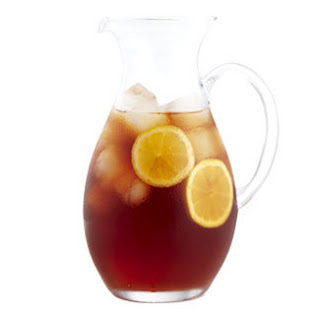 The Republic of Tea also has iced tea recipes to keep you hydrated all summer long. And, I might add, they have some pretty cool-looking glasses and pitchers and stuff. 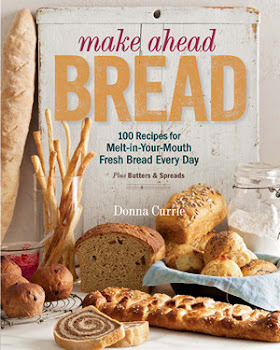 I was just browsing there, and I found a few things that might have to fall into my basket because they'd be really lovely in blog photos. And, as usual, there's a promotion this month. If you purchase one tin of The Republic of Tea’s new Large Iced Tea Pouches between Tuesday, May 21 and Tuesday, May 28 and you use the promo code, you will receive one complimentary bottle of agave nectar which you can use to sweeten your tea or for whatever else you use agave for (limit one per customer). The promo code is #ICEDTEA4. This post is part of my sponsored participation with the the Enlightenment TEAm. All tea-sippin' opinions are my own.